The Adventure Zooom balance bike is a good all round, quality balance bike, with a sleek and stylish design and a range of excellent features. The bike is aimed at the core balance bike age range of 2-5 year olds, and it comes with two seat posts which gives it one of the largest seat height ranges of all balance bikes as the seat can be adjusted from 34 - 51cm. This means that the bike might be slightly too big if you are looking for a 2 year old, but it would be a perfect fit for most 3 year olds looking for their first bike. You can read our guides to the best balance bikes for 2 year olds and 3 years old elsewhere on this website. The extremely large range on the seat height means this bike should be with your child until they are ready for a ‘proper’ pedal bike. You really get what you pay for with the Adventure Zooom balance bike, as it boasts a range of quality features including a lightweight 6061 aluminium frame, a rear V-brake, quality alloy rims and Kenda air tyres. The aluminium frame helps the bike to weigh in at 5.5kg, so although this is heavier than Puky and Strider bikes, it is still lighter than the steel frame models from brands such as Kettler. These bikes are very robust and should be able to withstand most of the knocks and scrapes that an excited young bike rider will put it through. If you order online, then you will have to part assemble the bike, but it should come with an instruction sheet so the process shouldn’t take more than 15-20 minutes. All these features give the bike a very professional look, and it is available in either silver or blue. It is sure to be one of the best looking balance bikes in the playground, and it is available for between £90 - £100. This means it is towards the higher end of the balance bike market, but the Zooom balance bike is definitely worth looking at if you are looking for a quality bike! The Boppi balance bike is a great value bike that is available as either a wooden balance bike or a metal balance bike. Both bikes are priced at around £35, so this is an excellent option in the budget balance bikes category and a very good alternative to the best-selling Chicco Red Bullet Balance bike. The bikes are manufactured by Bopster, who are a UK based company that offer a great range of balance bikes, trikes and scooters as well as go karts and skateboards as well. 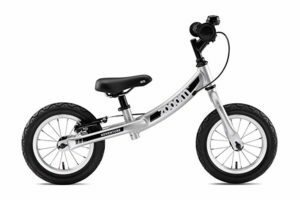 The metal version of the Boppi balance bike includes a strong and light tubular frame with features including an adjustable padded seat and cushion pad handlebars. The bike frame weighs just 3kg, so this compares well to the Chicco Red Bullet Balance bike of 2.7kg and should be comfortable for a 2 or 3 year old child to handle. Although the Boppi metal balance bike is slightly heavier than the Chicco Red Bullet balance bike, this is because the Chicco bike is very small and the short wheel base means that it can be difficult to handle for small children. The extra weight of the Boppi balance bike means the bike is slightly longer and better balanced. The all-important saddle height starts at 30cm and can be increased to a maximum of 40cm, so this is a good range and comparable to other good bikes in this sector. The lowest saddle height we have seen is 29cm on the Puky LRM Learner Bike and the Strider Classic, which are both much more expensive bikes. Another feature of this metal Boppi balance bike is the 11 inch EVA tyres. This means that the tyres are filled with foam so they are puncture proof, and these sorts of tyres are also used on most Strider balance bikes. EVA foam tyres are excellent for younger children learning to ride on smooth surfaces and they also require less maintenance. 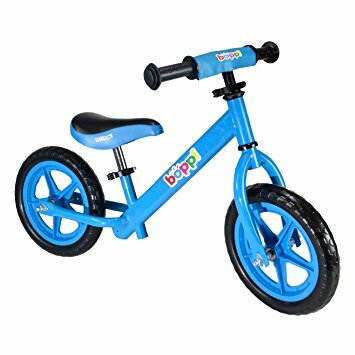 Although the metal Boppi balance bike does not offer many additional features, it is an excellent basic balance bike, a great choice for 2 or 3 year olds and superb value at around £35. It is available in up to 6 different colours including blue, red, pink, yellow, purple and green. Boppi balance bikes are also available as wooden balance bikes, with an environmentally friendly birch plywood frame and a choice of several exciting colours and designs. As with most wooden balance bikes, the saddle is not as adjustable as the metal version of the bike, with just two heights available at 35cm and 39cm. This means that a 2 year old might find the lowest saddle height of 35cm too high so this bike is better suited for 3-5 year olds. 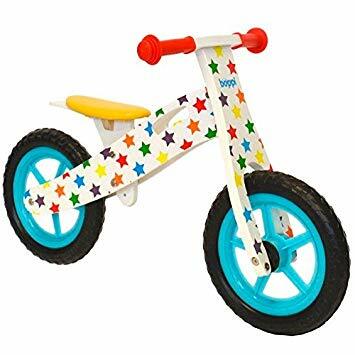 This bike also features EVA foam tyres, a detachable bell and padded handlebars, and as the frame is wooden it is available in a choice of fun designs which have been painted on to the frames. There are over 10 designs to choose from including Flame, Purple Flower, Space, Blue Racer and Hand Print (pictured). An integrated carry handle is included for when your child gets tired and you need to carry the bike, and carrying the bike shouldn’t be too difficult as this bike weighs just 2.5kg which is one of the very lightest bikes on the market! The wooden Boppi balance bike is also very competitively priced at around £35, so it is a great alternative to the Jiggy Wooden Balance bike which is another good quality wooden balance bike available at a similar price. These Boppi balance bikes are both great bikes and excellent value for money, with the metal bike having the advantage of a more adjustable seat but the wooden balance bike is lighter and available in fun and eye-catching designs. We hope this review helps you to find the best balance bike for your child and don't forget the accessories such as a bike helmet and gloves.